Join AGC At Our First Time Home SELLER Class! Ask Gina & Company, with Keller Williams Loudoun Gateway, has made plans for you this weekend! 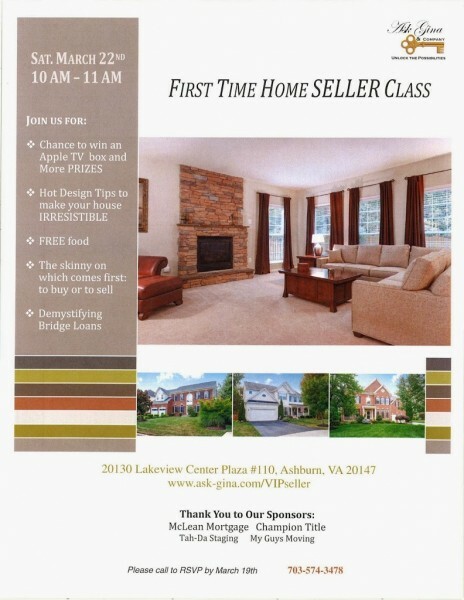 Come by our Ashburn office from 10:00-11:00am this Saturday to learn tips for selling your NOVA property. If the valuable knowledge you’ll gain isn’t enough, there will also be free food and the chance to win an Apple TV as well as other prizes! Please call our NOVA office at (703)574-3478 with any questions and to RSVP!